Why wedding ring is worn on the fourth finger...its very interesting!!! Why should the wedding ring be worn on the fourth finger? 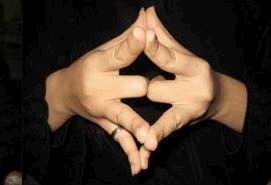 Firstly, open your palms (face to face), bend the middle fingers and hold them together - back to back Secondly, open and hold the remaining three fingers and the thumb - tip to tip (As shown in the figure below): Now, try to separate your thumbs (representing the parents)..., they will open, because your parents are not destined to live with you lifelong, and have to leave you sooner or later. Please join your thumbs as before and separate your Index fingers (representing siblings)...., they will also open, because your brothers and sisters will have their own families and will have to lead their own separate lives. Now join the Index fingers and separate your Little fingers (representing your children)...., they will open too, because the children also will get married and settle down on their own some day. Finally, join your Little fingers, and try to separate your Ring fingers (representing your spouse). You will be surprised to see that you just CANNOT....., because Husband & Wife have to remain together all their lives - through thick and thin!! Please try this out............. ISN'T THIS A LOVELY THEORY?